New Graduates - Get a $500 Rebate on your new Focus or Fiesta! Petrie Ford is offering a $500 Graduate Rebate for any new graduate (or if you will be a graduate within the next 4 months) on any new Fiesta or Focus! Post-graduate students are eligible and there's no limit on your age! Hey, who doesn't like a free $500 rebate for being a graduate?! Have graduated (or will graduate within 4 months) from an accredited university undergraduate program, or from an accredited college program (2 or 3 year). Have graduated (or will graduate within 4 months) from a recognized military or police academy. Vehicle must be purchased or leased in the name of the graduating student. 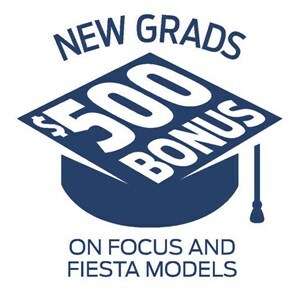 New Grads get a $500 Rebate on Focus and Fiesta's!